Tonight is the night a world premiere takes place at Union Films. Cue a mass of hysterical screaming students. Or not. 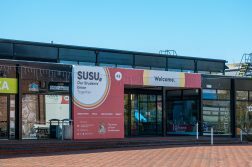 Bond star Gemma Arterton is due to walk the red carpet outside the student union in under an hour and there is nobody about! Only a bunch of student media representatives with self-inflated egos (including us). This will be our last post before the premiere, as we now must leave the heatwave occurring in media resources to take our place in front of the screaming masses (we can only hope).